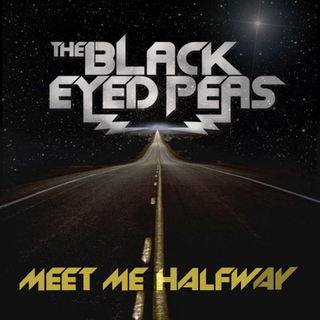 The new Black Eyed Peas song "Meet me Halfway" is a perfect demonstration of the Antahkarana Rainbow Bridge between Heaven and Earth, the Body and Spirit, and the Thelemic Formula of the Aeon of the Child Horus/Aquarius. Below is my Esoteric DiaGnosis of the symbolism expressed in this wild video. And many more thoughts. 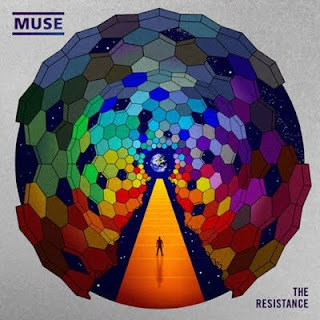 The cover of the Album itself having the Boltz of Divinity striking the End of the Yellow Lined Road or the Cap of the pyramid at the end of the Yellow Bricked Road however youd like to see it. Notice also the Star*, reminding us of the Aeon of Horus/Aquarius. 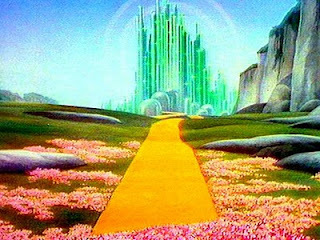 Muses new album depicts the POV of the Higher self traveling the Yellow Bricked Road to Earth, enveloped by the Rainbow Bridge. Over at the Vigilant Citizen blog the Author has come to almost the same exact conclusions I have, Ive copied some of the authors screenshots, Ill be using my own terminology but saying almost exactly the same thing, with a Bit of Crowleyan Discourse for those interested. The Thelemic Nuit, whos Law is Love. 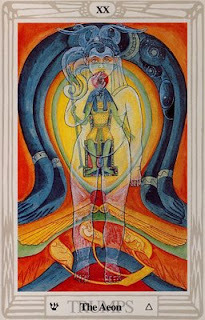 Representing the Feminine inner/lower Earthly plane, she is the Serpent of the Earthly Self. She is laying to the ground, very grounded as a snake. Here another member of the group Apl.de.ap sits up in the Astral plane Cosmos, in Eastern Mystic gear, he is The Higher Divine Self, the Ideal self, the Thelemic Hadit Consort of Nuit, we can see Him as Chokmah-The Beast or the Divine Will, the Holy Spirit, or Shiva seeking Unity with Fergi Shakti. He is the Star and she is the Womb of Space through which he radiates. So here we actually see a symbolic allegory of Kundalini Enlightenment or the Union of the Higher and Lower Self, also known as the Antahkarana, the Rainbow Bridge Between Earth(body) and Heaven(Spirit). Vigilant Citizen also picked up on the Pine Comb, Symbolic of the Pineal gland, known as the Seat of the Soul, the gland which secretes the Chemicals that create our personal universes, and the vague location of the 3rd eye and Crown Chakras of the Higher planes. 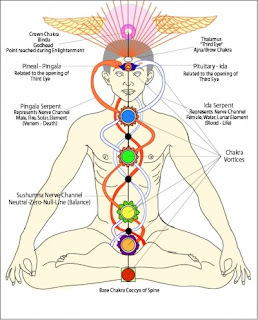 His staff can be interpereted as the Alignment of the Lower Chakras of the Spine in Communion with the Higher Chakras and Pineal Gland. Also a symbol of Sring Mysteries and Fertility. Vigilant Citizen also pointed out this great picture which depicts the Pineal Gland and the Kundaliin energy flowing from the Fergi (earth)Chakra to the Apl.de.ap(heaven) Chakra. 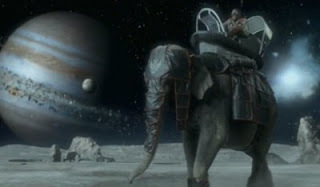 On Elephant back we can see Apl de Ap traversing space, seemingly passing Jupiter, while on an Elephant. The Hindu Elephant Ganesha is a form of Jupiter as well, the Obstacle Remover, fits perfect with Jupiters western role as the Benefactor and bringer of Good luck and Abundance. Jupiter is also a Heavenly god so he also fits in perfectly with Apl.de.aps role as the Higher/Heavenly Divine Self. This video strongly dealing with the "other Side" should of course have some Jupiter(42) and Ganesh(Jupiter) symbolism somewheres in there. For for you and I, for for you and I, for you and I"
Finally see Furgie reaching into the Cube, the Square, representative of the Earthly Plane, the 4 directions, the Cube of Space, the world of Matter(root-mater-mother), We see Shakti-Nuith-Earthly Self reach into the Cube reaching for Contact* with her higher Self out there in the Cosmos. the Square is the Womb, the Receptive Earth Womb of Love, awating the Cosmic Will of Stars and Sunlight. She and the Cube also represent the Thelemic Aeon of Isis, the feral Era of pre-500bc when the Mysteries of Life were saught in the Feminine, Man was coming out of the womb of Unconsciousness and Innate behavior, mans diet was at the will of what Momma Gaia allowed him to forage, and when he died he returned to the darkness from which he sprang, and the religions of that Aeon were Matriarchal, and Women held more spiritual Significance as well. In this time Matter(mater-mother) was worshipped as divinity, and all the universe was a womb or breast for humanity to feed and Grow from. Worship of Divinity was Local (in Matter/Earth) " As Crowley quoted about the Isisan Aeon-"simple, quiet, easy, and pleasant; the material ignores the spiritual"
Here we can see Apl de Ap, representing the Aeon of Osiris and the Higher Ideal Self of Heaven. Hadit, the Cosmic Will of Stars and Light, he reaches into the Triad, a Symbol of the Ideal, Divinity, the Supernal Triad of the Tree of Life(kether chokmah, binah), the Unity of opposites. He walks into the Ideal Heavenly Stargate the Cross the Bridge to the Other Side to meet his Earthly Bride. 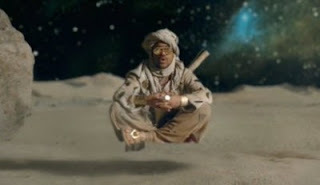 Note that Fergie was of the Earth laying to the ground, but Apl de ap can levitate and he sits in the creative cosmos on the "Other Side". 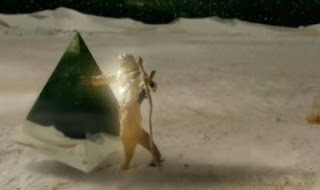 Now Apl De Ap also represents the Aeon of Osiris - 500 Bc -1904 ad. His Eastern Mystic appearance also adds to the signifiance of the mysteries and religions of the Aeon of the Osiris, the Sun began to reveal itself as Divinity, man found that Sunlight and Seed(male energies esoterically) were needed to create Agriculture and bring forth life on earth, and thus the Religous mysteries of the Time began to focus around the Masculine, Sun, Light, Rebirth, Ressurection,(thus Christ and the many Christ archetypes). Monotheistic Religions were forming and seeing God as a Male deity, also now the Earthly material plane became more of a stepping stone than a divine place, Religions beleiving in ressurection saught the Heavens Above where the Heavenly Fathers Kingdom was, out of reach, Non-local, on the "other side". The Sun the creator of life died and was reborn daily, and so were the mysteries of human life, death became conscious to man and Ressurection was the ultimate ideal, thus the era of Osiris is also the Piscean Age. SO the religions of this time began to deny the sacred feminine material earth, and only saw earth as a stepping stone to seek true spiritual divinity. During this time man was also becoming aware of his Unconscious(Isis), thus he identified with his Consciousness(Osiris), the Ressurection patterns equally reflected in our personal lives, all of us become aware of our unconscious instincts, and sometimes were not proud of them when we become conscious of them, thus we are constantly ressurected from the Unconscious to Conscious states as we develope and come to know ourselves. Apl De AP also notice is Non Local, hes out in the cosmos, just like the Sun when man began to worship it as God the Divine. Short hand, apl de ap symbolizes the Idealized Spiritual plane, likened to Osiris redeeming the dead in the Duat, Hadit uniting with this Thelemic Bride Nuit, and the Law of Love(Fergie) and Will(apl de ap). "Formula of Osiris, whose word is IAO; so that men worshiped Man, thinking him subject to Death, and his victory dependent upon Resurrection. Even so conceived they of the Sun as slain and reborn with every day, and every year." The Two Worlds(Aeons) are Married In the End, Rainbows appear, as Stars* are born and fall to earth. Love and Will have united, the Formula of the present Aeon of the Child. The Child-Horus is the Synthesis of Fergie-Isis and Apl De Ap-Osiris. Heaven and Earth are Married, Spirit Meets Matter, the Aeon of the Child has arrived. 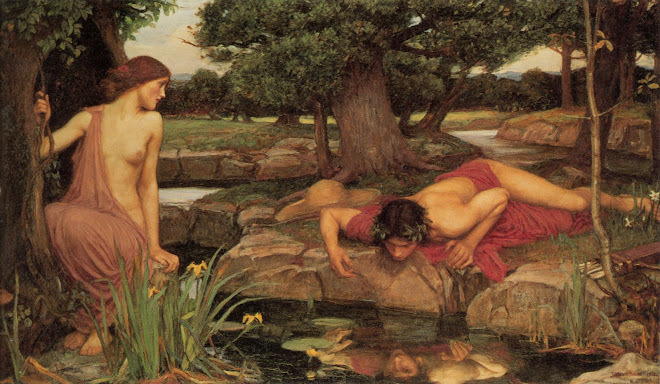 This is also Symbolized by the Lovers Tarot card, this is very much Connected with the themes explored @ the Synch Whole, Jupiter Janus and the Double Self, More on the Dual self and more exploration of the Pysical and Astral worlds uniting. There is also an Alchemical compliment to the Lovers, it is Temperence, the Saggitarius Tarot Card, also known as Art, it is the literal trading of the Spiritual Opposites energy, the Lovers is the Marriage, Temperence is where the Magic Happens. “Many have arisen, being wise. They have said ‘Seek out the glittering Image in the place ever golden, and unite yourselves with it.’ Many have arisen, being foolish. 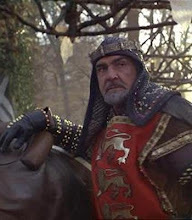 They have said, ‘Stoop down into the darkly splendid world and be wedded to that Blind Creature of the Slime.’ I who am beyond Wisdom and Folly, arise and say unto you: achieve both weddings! Unite yourselves with both! Beware, beware, I say lest you seek after the one and lose the other!" -Aleister Crowley on Uniting the Higher Spiritual self and the Lower Animal Self. The Evolution from Animal Man, to Divine Man is the power of Saggitarius, the Centaur and Archer. He is the Animal Lower Self Aiming to Acheive Higher Consciousness or Divinity. 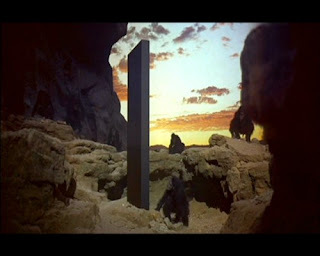 So this Brings to Mind David Bowman, and the Beginning of 2001 Space Odyssey where the Black Monolith marks the Evolution of Primates toward Humanity. Now we can see the Black Monolith marking the Evolution of Animal Man this is the Aeon of Isis. 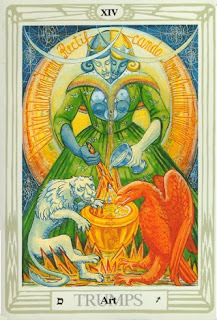 Saggitarius Tarot Card Temperence or Art IS the Rainbow Bridge of Uniting Opposites, Sulfur and Salt, Fire and Water, Animal and Man, Material and Sprititual. 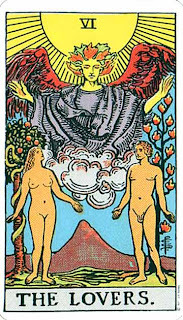 3 Rainbows deck out this Tarot Card, as it also is the Alchemical Key of the Philosophers Stone and the Elixir of Life. VITRIOL it reads over the Rainbow. Visit the Intereire Teirre Rectificando Invienes Occultim Lapidem. Translation, Seek the Center of the Earth(Animal Self and Root Kundalini Chakra), and there you will find the Hidden Stone( The Philosophers Stone). VITRIOL is the Key to Saggitarius, the Rainbow Bridge, and the Bow- Man, who Aims toward Divinity. Now the Monolith, I had a thought about. This is the Millenium Hilton, as Jake Kotze pointed out, this building was intentionally modeled by the Architect after the black Monolith of 2001 Space Oddysey, Strangely this Monolith Stands in the WTC Plaza unharmed by the Towers in 2001. Now the Monolith also makes me think of the Aeon of the Child and the Synthesis of Male and female, it is a Fallace, but it is Black, like the womb of Space, even containg Stars in this image above, this Symbol is a Trinity, it is the Male Force Tower of the Universe, and it is also the Feminine Womb-Void of Space, and the Child of them together is the Monolith. To me at least. When mister Crowley Acheived Contact* with extra human intelligenves in 1904 we Entered the Aeon of the Child, and the Two Worlds, The Isisian Earthly and the Osirian Divine Aeons have married and produced a Child, the Modern day, the Bridge has been built. The Aeon of the Child is A Synthesis of the two Previous Aeons, The World is now seeing the Focus on the Individual, unattached from the Traditions of the Osirian Aeon, and the Unconsciousness of the Isisian Aeon( I dont mean unconsciousness in a negative way, im talking about Natural Instinctive behavior). We can see Crowleys Law of "every Man and Woman is a Star" in the World of Reality Tv, Facebook, Myspace, as Andy Warholl said it well as well "Everyone will get their 15 mins of fame". Here we are, no longer bound by religous tradition, and lack of wisdom, welcome to the Aeon of the Child. Now Ive also gotta n, that Esoterically the Joining of the Earthly and Divine self, is also known as the communion with ones "Holy Guardian Angel" . The Guardian Angel is the Prince, the Union of the Anima and the Animus, the Father and Mother, The Prince is the Union of the Chid, the Prince is ones Holy Guardian Angel. This is known also as ones True Self, Higher Self, Higher Mind, Genius, Daemon, Phooka, ET. So Childhoods End, Originally called Holy Guardian Angel, the Aim of Crowleys Thelemic Methodology of Magick was to contact ones Holy Guardian Angel, Traversing the Tree of Life from the Eartly Plane to the Heavenly Astral plane, its the Rainbow Bridge, and the middle Piliar is the Spinal Rainbow Bridge, Saggitarius resides on the Middle Pillar connecting the Spheres of the Suns to the Moon, how Perfect. Childhood's End explores humanity's transformation and integration with an interstellar "hive mind" or Overmind. It also touches upon such matters as cruelty to animals, man's inability to live in a utopian society, and the apocalyptic concept of The Last Man on Earth. The 1953 edition of the story begins at the height of the Cold War, with attempts by both the United States and the Soviet Union to launch nuclear rockets into space for military purposes, threatening imminent doom for the planet." It gets much more interesting here, the Aliens Decide humans werent ready for their Apotheosis or Revelation from the Star men, they waited 50 years. "True to their word, fifty years after arrival, the Overlords appear in person. They resemble the traditional human folklore image of demons: bipeds with large wings, horned heads, and tails. The Overlords are larger than humans, their bodies covered with a hard, black armour shell. The Overlords' resemblance to the devil of human folklore is explained as a form of racial memory. The light from Earth's sun is too harsh for them, because their planet's sun has a dimmer redder light, and, though they can breathe Earth's atmosphere, the mix of gases in their own atmosphere is more comfortable. Humankind has, however, grown accustomed to the Overlords by this time and accepts them with open arms and, with their help, creates a Utopian world. The Overlords begin to pay a discreet interest in the human experience of the occult and psychic research. It is assumed by humans that this is part of their anthropological study of mankind. Rupert Boyce has the best collection of books on the subject in the world and when the Overlords ask to borrow them he refuses, but allows an Overlord called Rashaverak to visit him and study the books. He uses the visit to impress friends and has a party during the Overlords stay. At the party a Ouija board session is conducted, watched by Rashaverak. 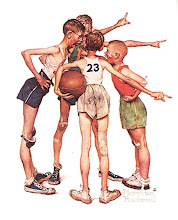 The answers to questions given by the board are all explicable from knowledge in the minds of the participants except when a young engineer named Jan Rodricks asks the identity of the Overlord's home planet." "Some Overlords remain on Earth, studying the evolved children. 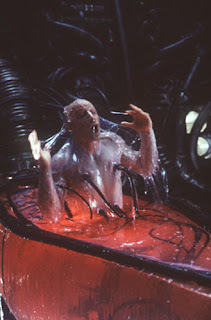 It also is revealed here that the Overlords have met and conditioned other races for the Overmind, and that humanity is the fifth race whose apotheosis they have witnessed. So The Holy Guardian Angel or Childhoods End, is about the descension of Higher Intelligences upon Human beings, and working them into a Galactic Hive Mind while paying Special Attention to Occult and Psychic Behaviors, WOW. And in the end the Children of this Apotheosis will not require Animal Bodies nor a place? Incredible. 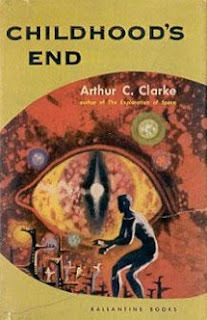 Arthur C Clark Also wrote a story called "THE STAR"
"The Star" is a science fiction short story by Arthur C. Clarke that appeared in the science fiction magazine Infinity Science Fiction in 1955 and won the Hugo award in 1956. The story was also published as "Star of Bethlehem". It is collected in The Other Side of the Sky. 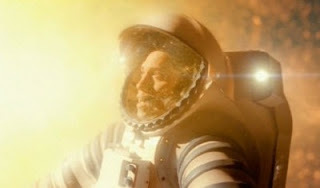 "The Star" is the story of a group of space explorers from Earth returning from an expedition to a remote star system, where they discovered the remnants of an advanced civilization destroyed when their sun went supernova. Their chief astrophysicist, a Jesuit priest, is suffering from a deep crisis of faith, triggered by some undisclosed event during the journey. 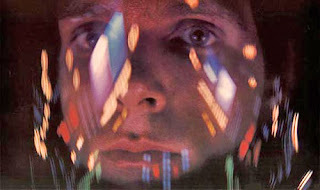 As the story unfolds, the reader learns that the destroyed planet's culture was very similar to Earth's. 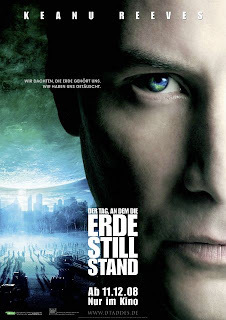 Recognizing several generations in advance that their sun would soon explode, and with no means of interstellar travel to save themselves, the doomed people spent their final years building a vault on the outermost planet in their solar system, whose Pluto-like orbit was distant enough to survive the supernova. In the vault, they placed a complete record of their history, culture, achievements, and philosophy, hoping that it would someday be found so that their existence would not have been in vain. The Earth explorers, particularly the astrophysicist-priest, were deeply moved by these artifacts, and they found themselves identifying closely with the dead race's peaceful, humanlike culture and the profound grace they exhibited in the face of their cruel fate. [O]h God, there were so many stars you could have used. What was the need to give these people to the fire, that the symbol of their passing might shine above Bethlehem?" We are all stars, our personalities are the Radiant Light of our True Selves. 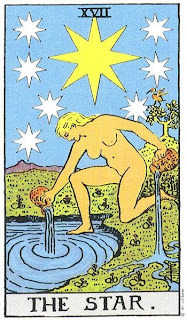 This is the Star Tarot Card for Aquarius, The Age we have entered according to most Astrologers. If the Age of Aries was Crowleys ISIS, Pisces Osiries, Aquarius would be Horus, the Child. So the Star IS also the Child. 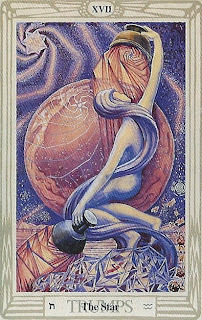 This Tarot card of Aquarius Symbolizes when a person who has Saught out their Place in the Universe, Coming back to Feed the Waters of Life, Pouring some in the water for others, Some in the Land to blossom into the Now, this card symbolizes Faith and Compassion, and Finding Ones place Amongst the Stars*. The Ruling Planets of the Aquarian were Paired up in 2009 on Election Day November 4th, much Aquarian Symbolism popped up around then as I explored in my Video "Lets do the Time Warp Dance",. The West Elected its First Black President after a long history of Slavery and Oppression, The Aquarian/Horus Age is the Golden Age where man evolves beyond ignorance and opposites, and the Universal water of life will be shared Equally, world Religions coming to understanding and peace, and knowing that all religions are one. This is also the Star of Sirius, and the Star of Bethelehem, Lady Nuit of the Stars and Milky Way is Flooding the NIle with the Rising of Sirius during the New Year and Dog Days. 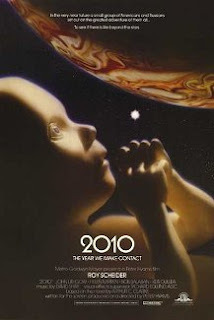 This is also the Star that marks the coming of the Avatar* The Child*, and also the Last Judgement or APOTHEOSIS. 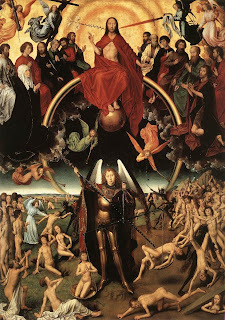 The Apotheosis is when Christ makes his Last Judgement on Earth, after Defeating the Anti Christ, Gods Followers at his Right hand will be lead into heaven, those at his left back into the Earth, the Dead will rise ( Souls and Bodys will be reunited), and Christ will return to heaven Set upon his Rainbow. Apotheosis means to be made Divine. Entheogen means to eat and commune and become the Divine. The last judgement of God On Earth, Apotheosis of Jesus set upon his Rainbows, is also marked by the coming of the Archangel of Fire Michael, Fire is Transformation, this card also represents the dawning of Higher Consciousness on the Lower self, IE Sous reuniting with their Bodies from their Black Saturn Lead Coffins. 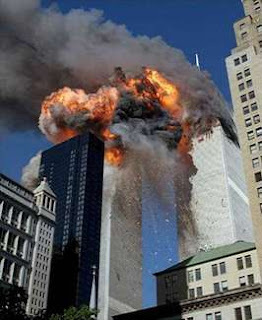 This will be the Day the Earth Stands Still, when the Avatar/Messiah will make his Last Judgement on Earth. 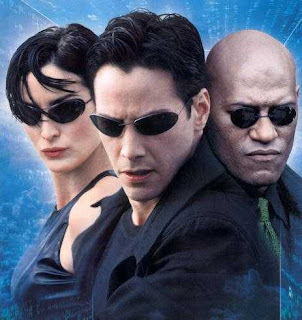 Babies in the Matrix, the Child. Neo the Reborn Child, the Prince of the Trinity, whos White Rabbit-Phooka-Holy Guardian Angel-Higher Self, Leads him down the Rabbit Hole. The Dog Star Chases the Lepus Rabbit into the Duat Hole, The Star of Aquarius, the Dog Star of Sirius. In the Last Judgement of the Bible the Archangel Michael and Jesus Defeat the Anti Christ and Jesus floats back up into heaven upon his Rainbow. This is the Crowleys Version of the Last Judgement Tarot Card which Featured the Archangel Michael of Fire. 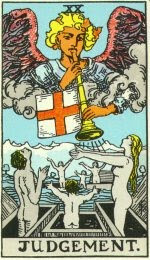 The Last Judgement Tarot card is One of 3 Elemental Cards in the deck representing the Elements Air(the Fool), Water(hanged man), and Fire(The Last Judgement/Aeon). Each of these 3 elements also represent the 3 Mother Letters and Elements of the Hebrew Alphabet. Aleph(Air) Mem(Water) and Shin(Fire). SO this card is the Element of Fire, the Archangel Michael, The Child of the new Aeon Horus, and the Hebrew letter for Fire and Spirit Shin*. Note the Letter Shin on the Bottom left of the Card, and the upward Triangle on the Right representing Fire. 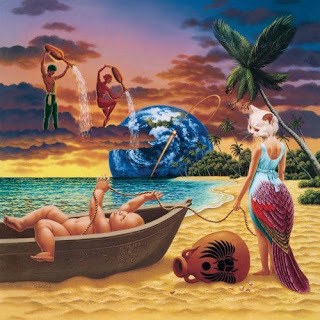 The Cover of Journeys Album IS a glyph of the Aeon of the Child. We can see Two Aquarians symbolizing the Dawned Age of Aquarius, pouring the Spirit of the Now into the Spiral Universe, then note the Peacock Tailed lady Nuit, Peacocks are symbolicof Aquarius, Note the Rope/DNA/diVINEitiy/Umbilicial cord leaving between her leads connecting her to the CHILD Horus who resides in a DUAT BOAT(Merkabah) alongside a Vase with KEPHERA the Egyptian Beatle God who pushes the SUN through the UNDERWORLD. Note also the Cat Headed Momma Nuit, for those who appreciate the Pheonix Palm Tree Geni, note that the Palm tree above Lady Nuit is A PHEONIX! To top it all off this album is called TRIAL BY FIRE, this is the Equivalent of THE LAST JUGDEMENT Tarot Card, and Crowleys Version of the Last Judgement, THE AEON, remembering its the Elemental FIRE card in the deck, with the Archangel of Fire MICHAEL, and the Hebrew letter for Fire and Spirit SHIN. Also remember that SHIN-Spirit-Fire-and TOOTH. 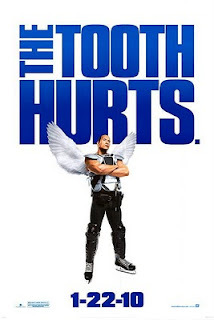 The New film the TOOTH Fairy just came out, featuring the Rock as none other than the Winged Angelic TOOTH (Shin-FIRE) Fairy. 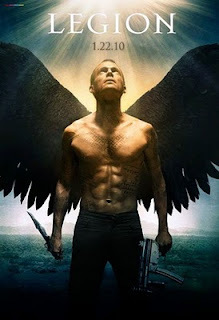 The Archangel Michael is also featured in Januarys LEGION. 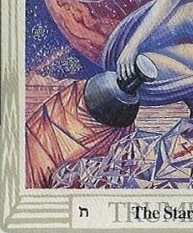 Thinking about the Spiral on the Aquarius Tarot Card, I saw something now familiar in the skys above the mountains on the bottom left corner of the image. Note the Spiral at the top of the image, and also whast happening at the Mountaintop of the Bottom left Horizon. Theres a Mountain, a Beam, and a Spiral formation in the Sky, just thought that was interesting. 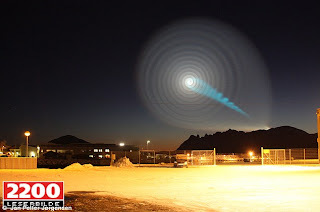 Remembering the Norway Spiral of December 2009, with the Mountains, the Beam, and the Spiral nature. 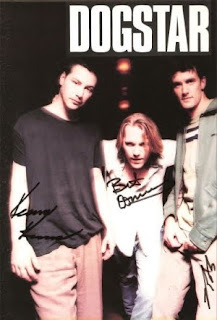 (album released 4/24/2004 and is 42:03 long&) how many 42z is that? Google Harpocrates, I think you will find some answers to what your looking for. wicked stuff. love these posts. educates me. i got something weird to share about archangel michael, but will do so later once i have some free time. thanks. Keep sharing that 'Fire', Indras! 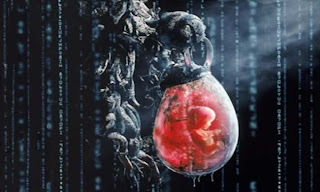 "...Start the countdown and Burn it down"
The Monolith is the womb... 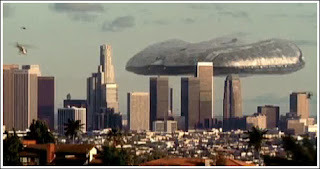 But then there's the space ship, it looks Phallic. 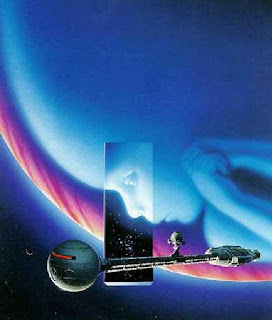 Also like Manly P. says, all Sci Fi is the alchemical King looking for the Queen. Plus the Eye of Jupiter is either the eye of Jupiter/Zeus/YahWah or it's vaginal... It wraps around it self. Jupiter according to Kotze is the source of our spiritual self... The source of the tree or the crown being shot at by the Bowman.... David. What an awesome read. Loved your analysis of the Black Eyed aPes vid and the tarot cards. I've recently been doing some research on Aldebaran, the Star of the East (attributed to Archangel Michael no less!) so this post fired me up on a number of levels. Thanks brutha. Looking forward to more. 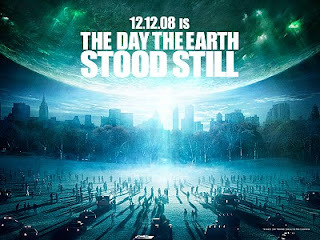 Just watched 2010 and saw that the opening explanatory text ends with the date December 9th. Yup the day of the Norway Spiral! "(At 21:33) When Dr. Heywood Floyd stands in the doorway of his sleeping son's room, on the wall to the left of his bed is a poster of an Olympic runner with the text "Beijing 08" on the bottom. Considering the film was made in 1984, and the Olympic Committee did not chose Beijing for the Olympics until July 2001 is a fun example of life imitating art and background detail that came true." 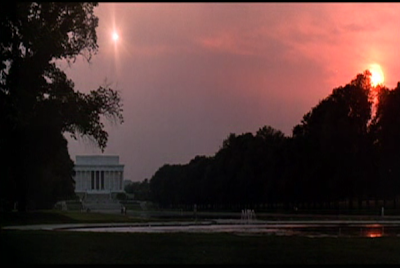 So the film links to an event 24 years before it happens. An event that just happens to include a ton of solar imagery as seen on the secret sun. Also funny that the comment above mine mentions shining crazy diamonds, cos in the book of 2010 that's what they find in the core of Jupiter! Mr. Panda ... we all love Mr. Knowles around here, thanks for the correlation. I wonder where the term "shine on crazy diamonds" comes from? Hmmm I dunno, but lots of songs have diamond as a metaphor for stars, Twinkle Twinkle little Star, Lucy in the Sky with Diamonds, Shine on You Crazy Diamond etc. Cockney's call each other diamond geezers too. New Diet Taps into Pioneering Plan to Help Dieters Get Rid Of 23 Pounds within Just 21 Days! Who Is Liam Neeson? A Dream Child? Will the real Jupiter please stand up?